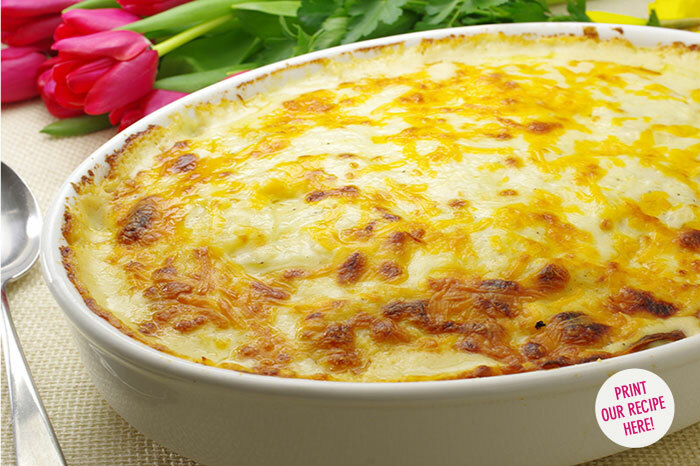 This is not your grandmother’s potato dish (as delicious as it once was). 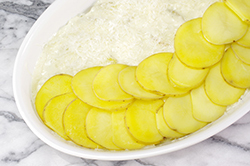 Thinly sliced potatoes are layered with a distinctive sauce flavored by garlic and a generous helping of Gruyère cheese. Freshly grated Parmesan cheese graces each layer while sharp cheddar cheese forms the beautifully browned crust once baked. 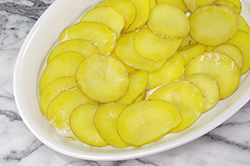 All the flavors combine in a wonderful way and infuse their magic into the potatoes. You’ll probably want to try this recipe ahead of time – not that’s it’s hard or tricky, but so you can enjoy it twice! We’ll wager that it’s the most enjoyed dish on the table! 1. In a large pot, bring the water to a boil and salt. 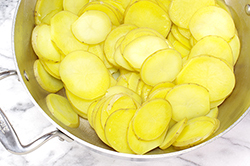 Meanwhile, scrub the potatoes and slice thinly crosswise, approximately 1/8-inch thick. Place the slices in the boiling water. Return to a boil and cook for 3-4 minutes; the slices will cook quickly and be tender, yet should still be intact; do not overcook. Drain the potatoes well. 2. In a 3 qt. saucier or saucepan, melt the butter. Sauté the shallots in the butter for 3 minutes, then crush the garlic and sauté for an additional 30 seconds. Season with the salt and pepper. 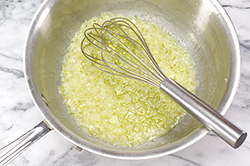 Add the flour to the butter and whisk for 2 minutes; this will form a thin roux. Add the cup of chicken stock whisking continually. 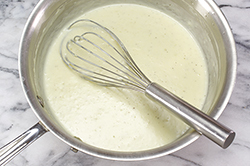 Add the 2 cups of milk gradually while continuing to whisk. 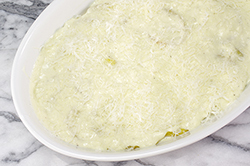 Remove the sauce from heat when thickened; add the shredded Gruyère cheese and stir until melted. Taste and adjust pepper and salt accordingly. 3. Preheat the oven to 350°F. Butter the inside of large baking dish. 4. 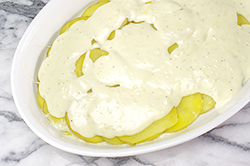 Spoon a half-cup of the Gruyère sauce on the bottom of the dish. Place a layer of overlapping potato slices. Spread another half cup of sauce on top, sprinkle with about a third of the grated Parmesan cheese. 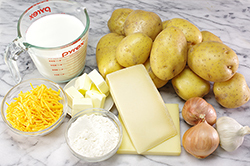 Repeat with two additional layers of potatoes, sauce, and cheese until the top layer is within a half-inch of the top of the dish. End with a thin layer of sauce. Sprinkle the cheddar cheese over the top. 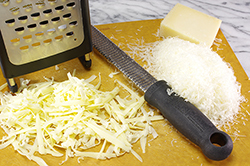 Finish with a light sprinkling of the grated Parmesan. 5. Loosely tent the dish with greased or nonstick aluminum foil; take care that the foil does not touch the top layer. Bake for 30 minutes or until bubbly and heated through. Remove the foil and bake uncovered for another 10-15 minutes or until the top cheese is nicely bubbly and browned.